Beautifully styled, this 18ct white gold ring features twisting diamond embellished shoulders, leading up to a magnificent diamond solitaire totalling a 1/4ct. 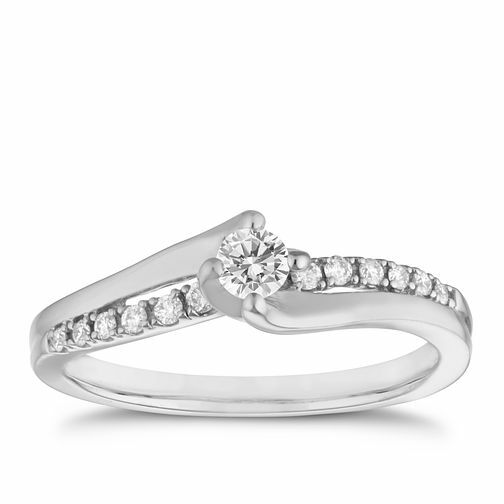 A sparkling twist on the classic solitaire. 18ct white gold 1/4ct diamond solitaire ring is rated 5.0 out of 5 by 5. Rated 5 out of 5 by Anonymous from Perfect engagement ring Myself and Other Half picked out this ring together. I originally saw it online and liked it but my other half didn’t. When we went to the shop I asked to see it and instantly fell in love. My other half also agreed that it was beautiful! The picture really doesn’t do it justice. It’s so sparkly and dainty. I have small fingers so didn’t want anything to thick or big. This ring is perfect. Due to its shape it will mean perhaps picking out a wedding ring to go with it might be a little more difficult than if it was just a ‘normal’ band but it did try on a normal band wedding ring and didn’t think it looked to bad. Rated 5 out of 5 by Anonymous from High quality setting, beautiful. The solitaire diamond is set absolutely beautifully. It appears as if the diamond is floating, but it is incredibly sturdy. I was given this ring three years ago and even after wearing every day it still looks stunning. My hands are tiny (K) and so big rings look silly. The curved shoulders, although they look very pretty, do restrict the type of wedding band that will fit beneath the engagement ring so take into consideration.